Lynn Parotti’s Time Under Tension was a compact exhibition that communicated a profound message in its simplicity. All of the work shown was a homage to The Bahamas’ aquatic environment, which – according to ARC Centre of Excellence for Coral Reef Studies – is suffering major damage because of coral bleaching, a direct result of global warming. Nestled carefully in The D’Aguilar Art Foundation’s (DAF) intimate gallery space, Parotti’s new series of works, “Bahama Land” is a vibrant epitaph to the beauty of the Bahamian coral. 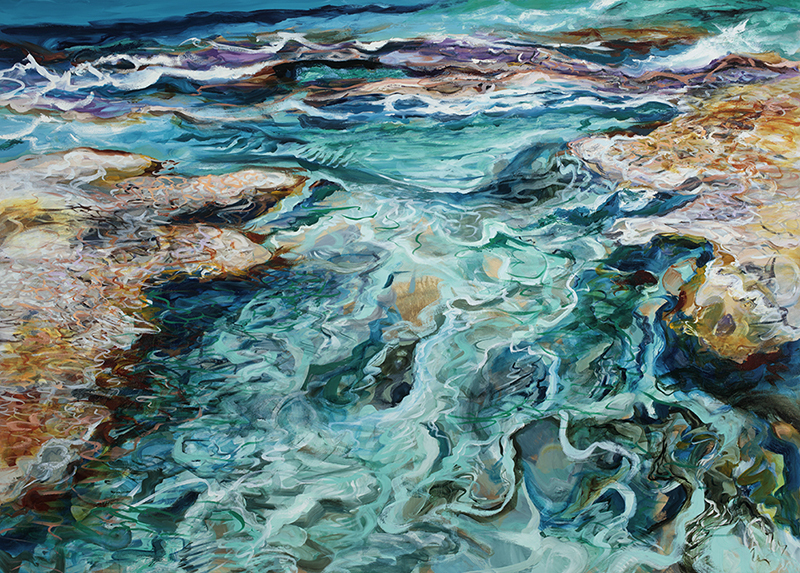 Her seascapes are illustrated from the point of view of somebody who is just above the water looking down (perhaps over the hull of a boat), or right above the ocean floor. When confronted with the vibrancy and electric colours of these spaces, which are depicted with such indulgent, viscous applications of oil paint, the works speak like relics of the past. Bridge, (2018). Lynn Parotti. Oil on canvas. 64.9” x 90.5”. Image courtesy of the artist and the D’Aguilar Art Foundation. The seascapes captured by Parotti in this exhibition are already few and far between. Recent studies led by Prof. Terry Hughes, director at the ARC Centre, have chronicled the great impact of the 2016 marine heatwave on the Great Barrier Reef and found that 29% of the reefs have lost two-thirds or more of their corals because of extreme marine temperatures. The Bahamian Islands are not immune to this damage. The exhibition’s key pieces, Bridge (2018) and Refuge (2018) both depict a seashore that is thriving under a high-tide; however, even though these are spaces of retreat, next to works such as Marsh Drizzle (2018), the scenes become tense with an energy of loss and commemoration. The DAF creates an environment where the artworks easily juxtapose one another, showcasing the duality of beauty and death that is key to understanding this exhibition. Scenes from Bridge and Marsh Drizzle reflect Parotti’s complex relationship with her home: yes, she adores its vibrancy, but she also mourns losing it. Living between The Bahamas and the UK, Parotti is preoccupied with depicting landscapes of the The Bahamas in ways that are true to both of these feelings. “Bahama Land,” like most of her other series’ about The Bahamas, comes across as both luscious and unsettling. According to art historian and curator, Allison Thompson, Ph. D., this duality among her paintings “references the uncertain condition of our contemporary existence in this world.” As she paints these spaces from a studio in North London, Parotti’s work is a visceral response to the possibility of never witnessing their beauty again. Scenes from the paintings reflect Parotti’s complex relationship with her home: yes, she adores its vibrancy, but she also mourns losing it. The degradation of the Bahamian environment has long inspired Parotti to create beautiful work in protest. Coral bleaching is just among the most recent environmental dangers that have forced her – among many other artists – to think about how we commemorate the Bahamian environment. Time Under Tension chose to highlight a message of conservation: in both the artistic, by capturing the beauty of the seascapes around us, and the practical, by taking care of and honoring the environment that surrounds us.